Around 50 school in 80 groups had participated this time. About 1000 students, teachers, parents were present for this day long event. The entire auditorium was filled with valor, and patriotism especially with the presence of our Chief Guests 1962 & 1971 Indo-Pak & Indo-China War vetrons of Indian Army Retd. Major Bhagwat Ganpat Shinde and Retd. Lt. Gen Jagjit Singh in presence of our Paschim Maharashtra Vibhag Pramukh Shri Sunil Kulkarni. Other chief guests present were Shri Gajanan Chinchwade, Shri Yashwant Limaye, Mrs. Ashwini Chinchwade, Shri Moreshwar Shedge, Dr. Ajit Jagtap, Shri Jaidev Mhamane. 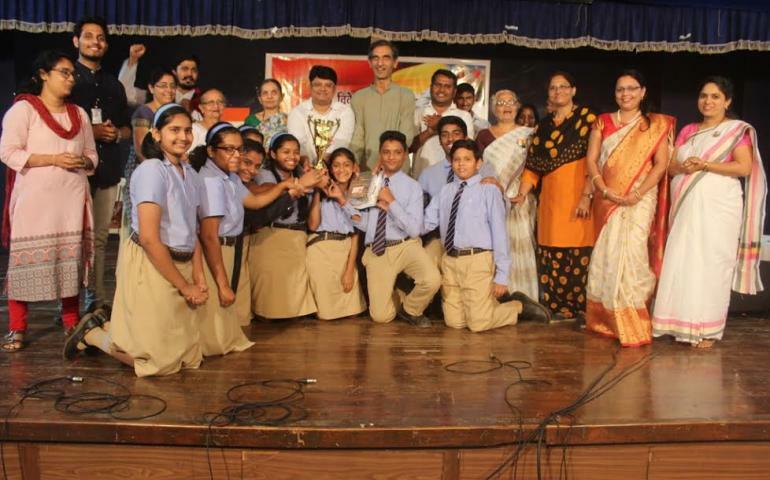 Zhep School, Kamayani School and Mai Bal Bhavan, the schools for the special and gifted children also gave beautiful performances and were felicitated with special awards. The judges for this competition were Mrs. Sonali Kaande, Mrs. Bhupali Shidhaye, Mrs. Vandana Raval, Mrs. Madhuri Kekane, Dr. Sunita Apte and Mrs. Aparna Kulakrni. Lt. Singh, Dr. Jagtap, Shri Sunilji, Shri Limayeji gave valuable guidance to the students. Mrs. Mugdha Sardeshpande, Mrs. Pooja Kulkarni, Shri Rohit Shenoy and Shri Jagajeet Kulkarni anchored the program beautifully. Our proud sponsors and donors include Sidhhant College Sudumbare, Vaatshar Mfg. Sys. Pvt. Ltd., Shri Moreshwar Shedge , Shri Bhausaheb Bhoir, Mrs. Sunanda Wagh, Mrs. Renuka Somnathan, Dr. Tamhane, Dr. Baviskar, Dr. Joglekar, Dr. Tekale etc. Tremendous enthusiasm of the student with disciplined support from the teachers, timely and disciplined organization of the entire program made it a big success. we have encouraged all the schools to atleast arrange for our various workshops like PDHH and Samartha for students and teachers. A heartfelt gratitude and vote of thanks to our pillar of strength Smt Arunatai & Smt Rekhatai and all the volunteers who work very hard for this program.